Four students busy marking and sawing on the sawbenches. 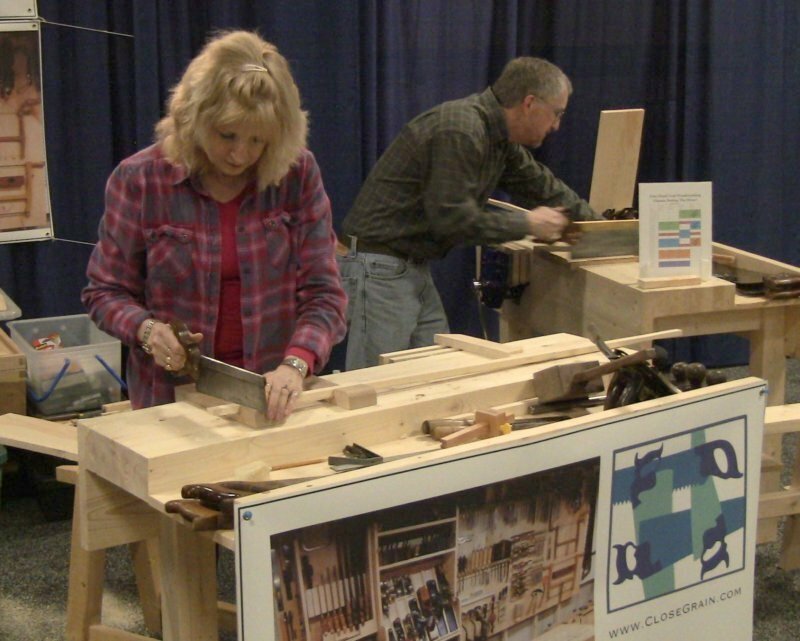 Saturday at The Furniture Project at the New England Home Show was as busy as expected. People were lined up out the door when I arrived just before opening, and they didn't stop coming until closing time. There were 4 students, Herv Peairs and his wife Margy, Andy McKenzie, and Alain LeBlanc. Several other people who had contacted me also came by throughout the day to watch and talk and play with the tools. I'm dubbing this Wives' Day, with thanks to three patient wives. This was a long day, handsaw class starting at 11AM, chisel class finishing at 7:30PM. It started with Alain's wife, Yvonne, who signed him up as a gift to him. She perused the show and sat with her knitting until they had to leave at 5. Then Andy's wife spent the whole time at the show, and Margy participated in the whole thing. 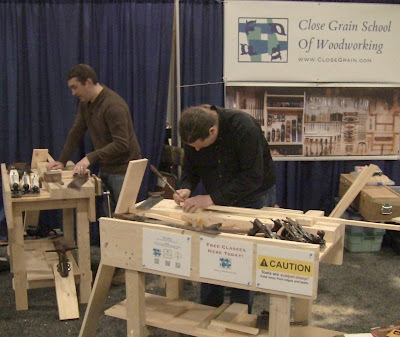 Alain finishing a cut with a backsaw as Andy marks a V-notch guideline with a chisel. Margy and Herv sawing on the bench hooks. Alain and Andy jointing edges. 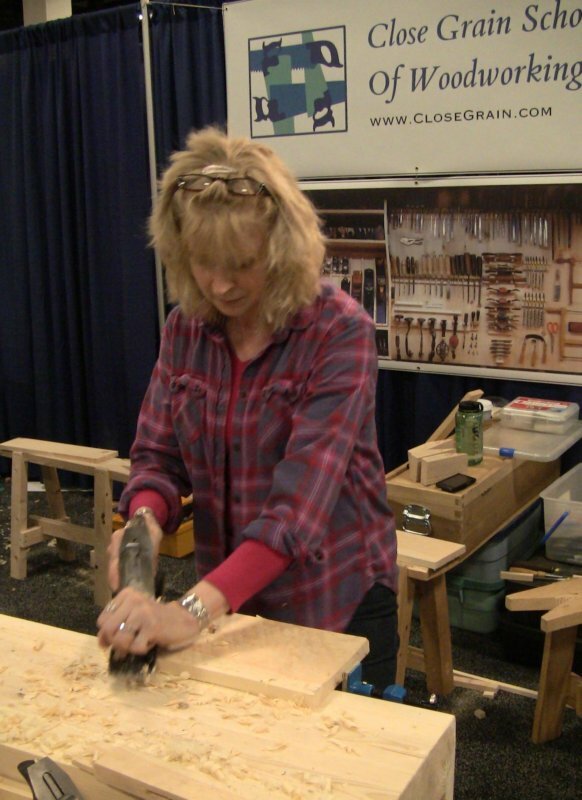 Margy thicknessing a board using a #5 with an iron cambered to an 8" radius. Herv shooting end grain on the shooting board. I didn't get any photos of the chisel session, but it was almost comical as I kept saying, "And let me show just one more thing you can use it for." The versatile chisel! I showed them how to do carving and shaping bevel up and bevel down, dadoes, edge and end grain rabbets, mortises, chopping, and paring. Regarding safety, I told them the chisel is the hand tool that can cause the most serious injury, so it's important to always follow the safe handling procedure. This consists of ensuring that no part of your body, your hand, your fingers is ever in front of the edge, and you always push it away from you. Even if your finger is wrapped around the side of the workpiece where it appears to be safe, it's not. The chisel may slip and go in an unexpected direction, and you can zip your finger wide open instantly, severing skin, muscle, nerve, tendon, and possibly even bone. You can render a finger or hand permanently unusable. 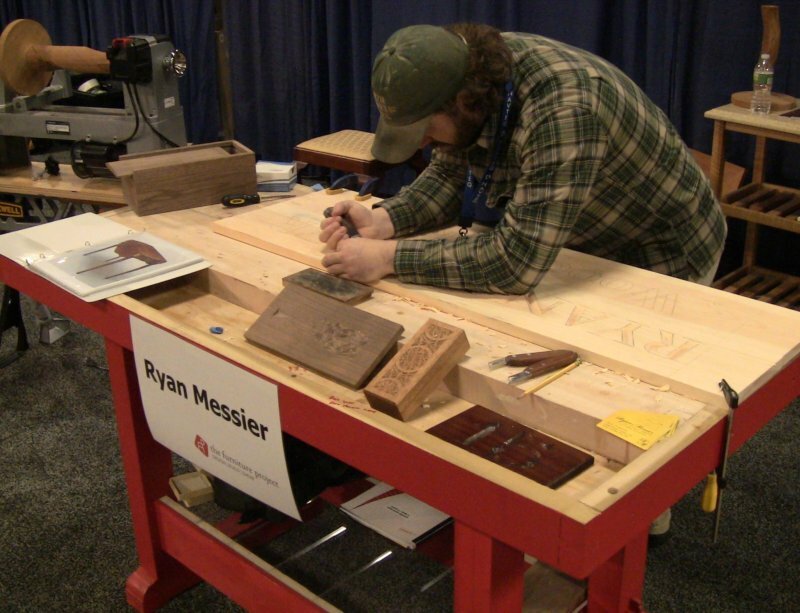 Students and visitors all loved the Paul Sellers workbenches. I had Paul's book out for people to flip through. His method of using an aluminum bar clamp stuffed with wood and clamped in the vise as a planing stop worked well. I do need to add dogs to the benches to use with the vises. Many people asked where they could get the Gramercy Tools holdfasts. I told them to get at least 2; I have 6 at home for my main bench and bench-on-bench, in addition to the 4 for these benches (and in fact I need to get 4 more so each bench will have 2). I did two sharpening demos, one somewhat impromptu. I always preface them by saying that if you want to start a fistfight between woodworkers, just bring up sharpening. I say that I'm going to show a way, there are many others, and it's a matter of personal preference whether you like it or hate it, but most of the concepts are common to the various methods. For the record, I sharpened all the planes irons and chisels using the convex bevel method on oilstones, and that's what I demonstrated. Paul Sellers uses this method on diamond plates. So you may commence cheering me or hating me. Given 20 blades to prepare for the show, this was fast and effective. 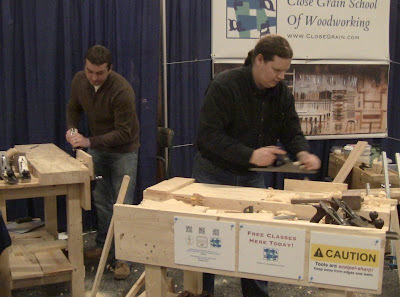 With the backs well-prepared to a mirror polish at the end (I used Chris Gochnour's method from the Aril 2013 Fine Woodworking #232; this article is now available online), the chisels left a surface like glass when carving off hunks of pine. 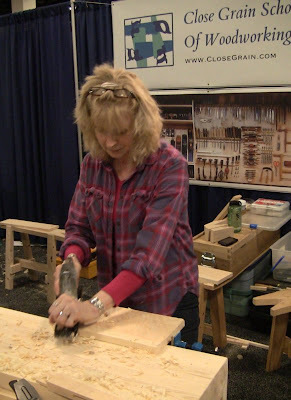 The biggest comment I get on sharpening handsaws is that every handsaw everyone has tried in the past was dull, they just didn't realize it until now. 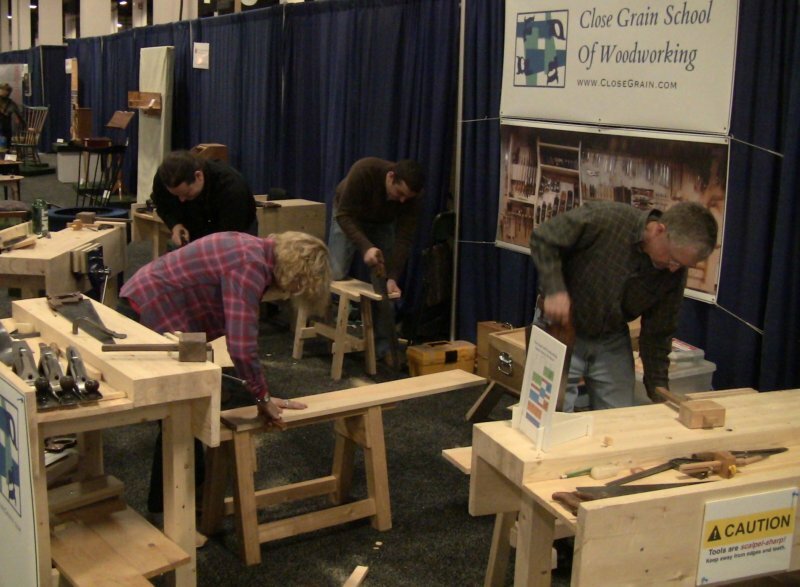 One quick cut with a sharp saw amazes them. 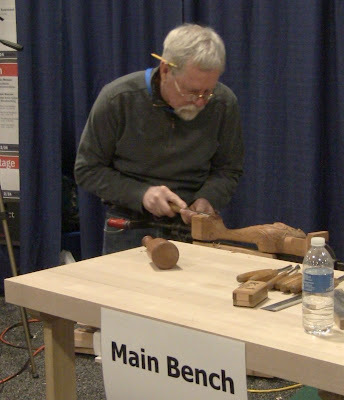 Phil Lowe demonstrating carving a ball-and-claw foot on a cabriole leg. 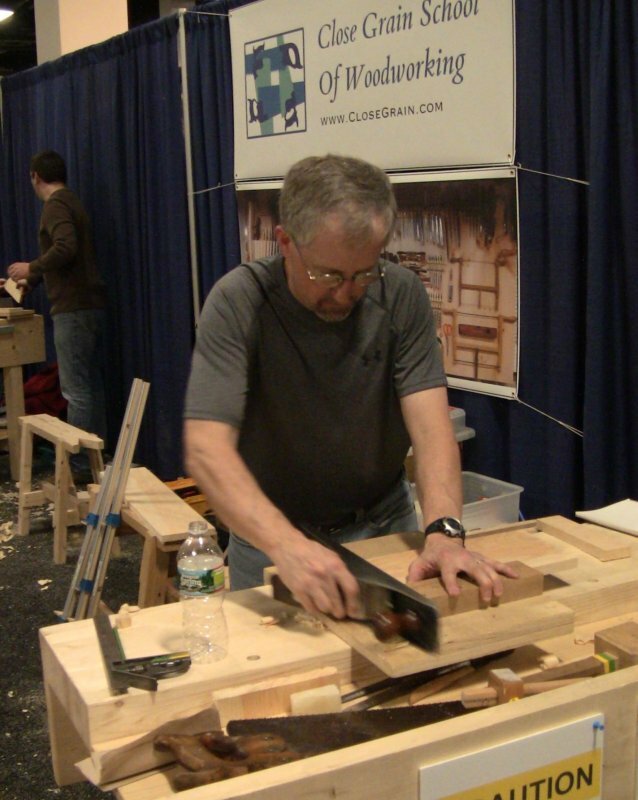 Phil Lowe, who runs the Furniture Institute of Massachusetts, stopped by to say hello. I had the privilege of helping him out with his booth this past Fall at the Topsfield Fair. 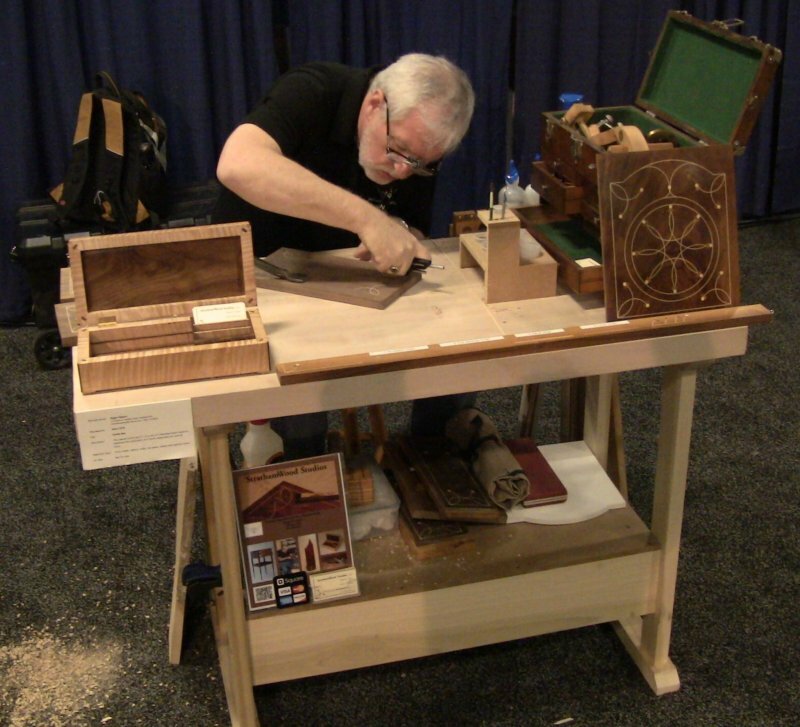 Roger Myers working on inlaid stringing. Roger is a fellow member of both SAPFM and the Guild of New Hampshire Woodworkers. Ryan Messier carving a sign. You can see some of his fine chip carvings on the bench. Ryan does all his letter carving with a simple Murphy knife, which is made in a small workshop three blocks from my house. The class was great -- thanks again! Margy and I both enjoyed the class very much. It was nice to try out some tools that don't make a racket. I'll keep an eye out for the new class schedule.